The rescue of 23 crew members in demanding and dangerous conditions was accomplished through the highest standards of skill, professionalism, crew co-operation, flexibility and determination. On Monday 14th August 2017, MV Cheshire, was on passage from Norway to Thailand with a cargo of approximately 43,000 tonnes of fertilizer, when an explosion occurred in one of its cargo holds. An accumulation of water had been discovered in the hold 2 days earlier, with temperatures of the cargo subsequently starting to rise as the fertilizer decomposed, resulting in the emission of large quantities of toxic gas. Initial intentions had been for the vessel to call at Las Palmas to address the emergency, but as temperatures in the hold continued to rise the Vessel was ordered to a position south of Gran Canaria. Whilst maintaining this position a large explosion occurred in hold number 4. The Maritime Rescue and Co-ordination Centre in Las Palmas were closely monitoring the situation. Having previously placed the Spanish Maritime Safety and Rescue Society (SASEMAR) on standby, they requested an immediate scramble of their rescue assets to assist with the incident. 2 salvage helicopters (call-signs Helimer 202 and 207) were quickly airborne and on transit to MV CHESHIRE. Helimer 202 (from Las Palmas) was the first to arrive on scene and witnessed the ship emitting huge amounts of toxic fumes. The crew’s immediate priority was to closely assess the conditions, the movement of the vessel and the magnitude of fumes emanating from the ship. Despite the obvious danger of further explosion, Helimer 202’s captain bravely positioned the helicopter over the ship and commenced evacuation, initially rescuing 4 seafarers. This required the crews rescue swimmer to be winched on to the deck, including leaving the wire and using breathing apparatus to assist one of the seafarers. As Helimer 202 was preparing to depart, Helimer 207 (normally based in Tenerife) arrived on scene, and quickly took over the rescue. The helicopter captain did not hesitate in again placing the whole crew in harms’ way, quickly winching the rescue swimmer on to the deck of the ship and moving between bow and stern to rescue a total of 11 personnel. The clear visibility away from the ship enabled good communications between the winchman and the rescue swimmer. However, the conditions on deck were such that the rescue swimmer needed oxygen when he arrived back in Las Palmas. As Helimer 207 departed the scene, Helimer 202 rejoined the rescue to complete the evacuation of the remaining 8 personnel. Unfortunately, due to the intensifying fumes the last 5 evacuees had to retreat to a sealed room for safety. The rescue swimmer therefore had to leave the wire and battle through the fumes to locate the remaining crew members and then rapidly guide them to the bow for evacuation. Having recovered all the ship’s crew, the rescue swimmer was being winched back on board when a second large explosion occurred in hold no 4. This could have had tragic consequences had it occurred earlier in the rescue. The rescue swimmer required medical attention on his return to Las Palmas due to the effects of fumes. Overall the entire helicopter crew demonstrated great skill and bravery during this very dangerous and challenging operation. 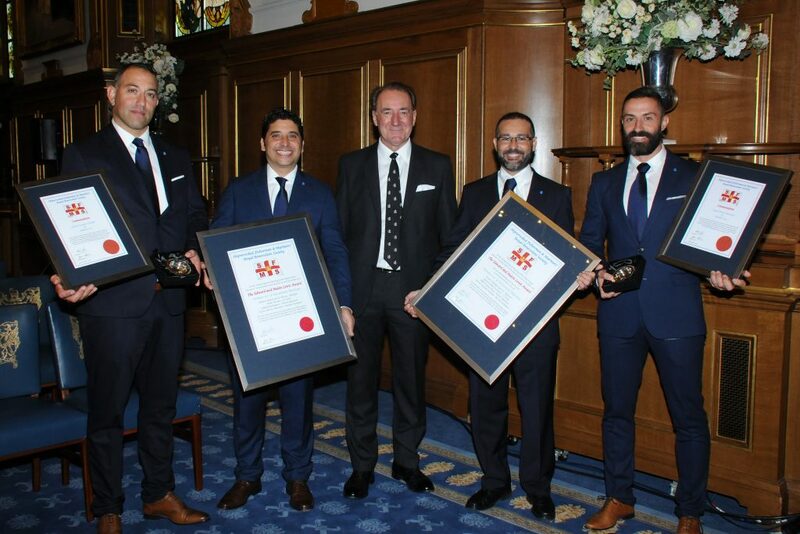 Their commitment and professionalism ensured the safe evacuation of 23 seafarers and was clearly in keeping with the finest traditions of the Spanish Maritime Safety and Rescue Society. They are thoroughly deserving of the Edward and Maisie Lewis award for an outstanding air/sea rescue.